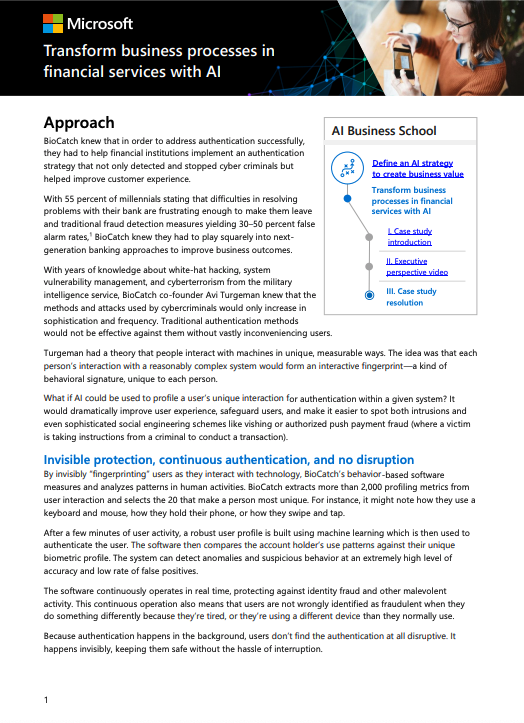 With years of knowledge about white-hat hacking, system vulnerability management, and cyberterrorism from the military intelligence service, BioCatch co-founder Avi Turgeman knew that the methods and attacks used by cybercriminals would only increase in sophistication and frequency. Traditional authentication methods would not be effective against them without vastly inconveniencing users. Turgeman had a theory that people interact with machines in unique, measurable ways. The idea was that each person’s interaction with a reasonably complex system would form an interactive fingerprint—a kind of behavioral signature, unique to each person. What if AI could be used to profile a user’s unique interaction for authentication within a given system? It would dramatically improve user experience, safeguard users, and make it easier to spot both intrusions and even sophisticated social engineering schemes like vishing or authorized push payment fraud (where a victim is taking instructions from a criminal to conduct a transaction).